One of the most powerful and versatile EQs money can buy. Every producer should consider investing in MAutoDynamicEQ. Solid general-purpose EQ. GPU-accelerated interface. Hugely useful automatic EQ. Highly customisable dynamics. Competitively priced, with free updates. None of the styles look so good. Steep learning curve to truly master it. MeldaProduction has produced a lot of plugins in the last few years, many of them combining features and functions that you simply won't find sharing a bed anywhere else. 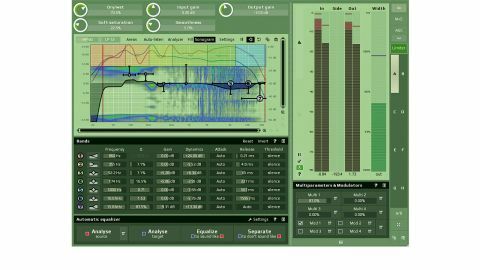 MAutoDynamicEQ is no exception, merging dynamic EQ with matching EQ, along with the wealth of other features that are standard throughout the entire Melda range of plugins. In fact, we've reviewed MAutoDynamicEQ before, but with the global v8 update to the entire line and this being one of Melda's flagship - and most complex - processors, we decided it more than merited a fresh look. Disregarding its 'auto' and 'dynamic' aspects, MAutoDynamicEQ can be used perfectly well as a 'normal' EQ, offering up to seven bands, each of which draws on a collection of 14 filter shapes that can be edited in incredible detail if required. Check out our hands-on video above to see the filters - and other features - in more detail. As well as that, there's the ability to add up to 16 harmonics (each one turned on or off via its own button, totally independently of the rest) on top of the fundamental frequency of each EQ band, meaning you can increase or decrease discrete tonal components of a sound with relative ease - ideal for removing mains earth hum or enhancing the tone of a floor tom, for example. So, let's talk about the automatic EQ function, which is a supremely easy-to-use take on the 'match EQ' idea. First, you play a 'source' sound through the plugin and click the 'Analyse source' button. Then, you play the actual material you intend to target with the EQ through the plugin and click 'Analyse target'. From there, you have two options: Equalize, which generates an EQ curve to make the target sound similar to the source, and Separate, which produces an EQ curve designed to reduce the dominant frequencies of the source in the target. Both modes work surprisingly well, and you can rein in over-the-top EQ settings should you need to by manually editing the bands and/or lowering the Dry/Wet mix control at the top of the interface. "We found it useful on mixing duties, specifically for getting simultaneously occurring sounds to gel"
You might assume the most obvious application for the automatic EQ would be mastering, but we actually found it more useful on mixing duties, specifically for getting simultaneously occurring sounds to gel, which it does quickly and with very little work required. We also found many creative avenues worthy of exploration by loading in 'experimental' sources - for example, using a pink noise source to smooth over the frequency spread of a piano, making it sound bolder and fuller in the mix. We were also able to tame harsh synth parts by feeding the very high, piercing notes in as the source material, then applying the Separate algorithm to the lower notes, thus reducing abrasiveness. The 'Dynamic' in MAutoDynamicEQ's name refers to the fact that the seven EQ bands are also dynamic - they can be configured to compress or expand their specific frequency ranges using their level, Threshold and envelope controls. You even get Auto Attack and Release options (loosely emulating the behaviour of an opto compressor), and external sidechain input is in place for frequency- conscious compression and expansion effects. For example, we got great results boosting the low end of a snare and using the dynamics controls to clamp down on the boosted frequency range with a punchy attack time, helping to enhance the drum's definition. On top (and bottom) of the seven dynamic EQ bands, additional high- and low-pass filters are also onboard. Each can be set from a smooth 6dB/octave slope all the way up to a super-steep 120dB - although they aren't dynamic (presumably because they're not used to boost or cut 'vertically') or included in the Automatic EQ analysis process. Like the rest of MeldaProduction's v8 plugins, the new version of MAutoDynamicEQ benefits from a reworked user interface. It also sports a frequency analyser that indicates musical note values where applicable, and a sonogram that displays a real-time spectral view of the signal - handy for homing in on troublesome frequencies, like the annoying resonances of a cymbal or high string part. "As if its comprehensive EQ/dynamics operation wasn't enough, four very flexible modulators are on hand"
As if its comprehensive EQ/dynamics operation wasn't enough, four very flexible modulators are on hand, too, for modulating the EQ controls (Frequency, Gain, Q, dynamics, etc). These multipurpose marvels serve as envelope followers, pitch-trackers, advanced LFOs (up to 10Hz with optional tempo sync and morphable waveforms) and more, opening up a wealth of possibilities that make MAutoDynamicEQ a powerful sound design tool as well as an EQ. MeldaProduction clearly intends for MAutoDynamicEQ to become your multipurpose go-to equaliser, even catering for beginners with an 'easy' screen that gives access to a range of simplified parameter sets via a selection of about a dozen presets designed for typical studio applications (Master enhancer, De-esser and Bass vs bass drum fix (sidechain), for example). This is without doubt one of - if not the - most feature-rich EQs on the market, catering to myriad 'special case' uses by enabling advanced techniques far beyond the functional boundaries of a conventional EQ. Ultimately, it's a must-have plugin for the producer who likes to get deep into the intricate details of their sounds for the purposes of mixing, mastering or any kind of creative editing. Simply stunning.